It is often said that the Timberwolves playoff run to the Western Conference Finals in 2004 was the franchise’s apex, and the moment listed by most fans as their favorite in team history. While technically true that it was the most successful season in history and the closest – in a direct sense – the team came to a championship, I personally disagree with the notion that this was the best time to be a Timberwolves fan. To me, the best times were in the two seasons when Kevin Garnett was paired with Stephon Marbury to form the most exciting young core in basketball. In the 1996-97 season (Marbury’s first and Garnett’s second) the Wolves won 40 games and made the playoffs for the first time ever. KG was just two years removed from high school. So was Steph. Along with Tom Gugliotta, they were the best players on the team. In the franchise’s first seven years of existence leading up to this, the Timberwolves hadn’t ever won even 30 games. This marked a 14-win improvement from the season prior — KG’s rookie year — and it was immediately obvious that the explosive playmaker guard was a perfect match for the do-it-all seven footer. The following year the Wolves won 45 games, Garnett became a perennial All-Star, and the Wolves took the Payton-and-Kemp Supersonics to a fifth game in their best-of-five opening playoff series. Watching Marbury and Garnett for those couple of years was not unlike what Thunder fans probably experienced when Russell Westbrook and Kevin Durant blossomed and quickly became a playoff powerhouse. When you consider just how rapidly the Wolves young core was developing — these guys were barely removed from high school — it was fair to wonder if they might win multiple championships as they led the Timberwolves for the next dozen years. Obviously the championships did not happen, and I don’t mean to remind of all of the bad memories that followed. Suffice it to say, Marbury and Garnett are one of the great “What if?” discussions in NBA history. But if you remember what those games were like when KG was still so young and undeveloped, you might have had similar feelings last night, watching Andrew Wiggins play the best game of his young career, at Denver. In a winning effort, Wiggins posted a stat line of 31 points, 9 rebounds, 4 assists and 3 blocks. That is Garnett territory. The two players are very different, and yet they share important similarities. They are different in that Wiggins is more of a scorer and less of a passer than KG was, and for the more obvious reason that Garnett was seven-feet tall and much more of an interior player. (Though he did play some small forward in his early years.) But they are similar because they — at their respective positions — have length and athleticism unlike any of their peers in the NBA. That’s not normal. Being able to fly has advantages in basketball, especially when the player has a picture-perfect jumpshot to go along with those wings. Jacoby: They put him on you? Jacoby: You can’t do anything down low. You can’t do anything outside. That about sums up what Garnett was capable of, with his totally unique blend of length, agility, and determination. He may not have become the greatest all-around player to ever play, but he was capable of doing certain combinations of things that nobody else has ever been able to do. These physical gifts were immediately apparent, and it did not take long to notice that he was wired in a way that they would not go to waste. 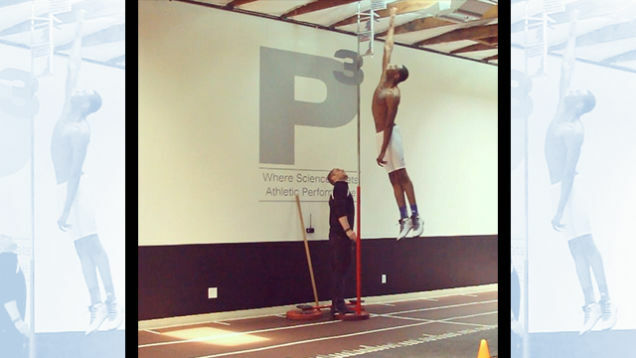 And that’s similar to what we’ve been seeing from Andrew Wiggins, lately. After a predictably slow start, adjusting to the NBA game with only one year of college experience under his belt, Wiggins is getting better at a rapid rate. He’s scoring, rebounding and even doing some playmaking for teammates, collecting more assists than he was at the start of the season. He’s quickly becoming an all-around impact player with a huge, unknowable ceiling of potential. The elephant in the room of this discussion is that I’m comparing a duo — Marbury and Garnett — with a single player, in Wiggins. The Wolves need another star player; preferably two more. They could arise from within, if Rubio ever gets healthy and improves his shooting that he is working on with a specialized coach. Or if one of the less-likely candidates — Gorgui Dieng, Shabazz Muhammad, Zach LaVine, Anthony Bennett — make big strides over the next season or two. If not, the Wolves will need to pluck a star out of the 2015 Draft where they will no doubt be picking near the very top. I can’t pretend to enjoy watching all of these games, this year. The roster deficiencies, uninsured against injuries, have the team severely handicapped to compete on many nights. It is not fun when they lose so much. But if Andrew Wiggins continues this development and becomes a franchise cornerstone, that changes the dynamics quite a bit and fans will probably be in for a treat — especially if they can surround Wiggins with a star-partner in crime and a workable system for success in the modern era. That would most definitely be fun.